When I talk to providers about Propeller, I hear a lot of positive feedback about how it could benefit their patients, help them reduce cost and drive better population health. But I also hear three common fears: Who’s going to manage this? How do I get my patients engaged? And how will my patients react when I start using a digital tool to manage their disease? 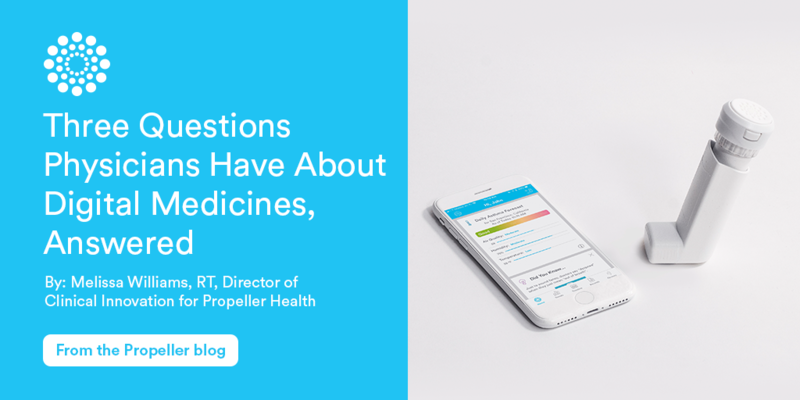 This week, as Propeller leaders meet with clinicians at the American College of Allergy, Asthma and Immunology Annual Scientific Meeting 2018, I wanted to share my thoughts on these three questions to demystify how a digital medicine works in clinical practice. Q. Who’s going to be responsible for managing the digital medicine platform? Won’t it take a lot of time? Time management is the most common question I hear from clinicians about digital medicines, and for good reason. In a recent, rather scathing piece in The New Yorker, Dr. Atul Gawande quoted statistics that only a third of physicians agreed that their work schedule “leaves enough time for personal/family life.” The introduction of digital tools such as EHRs and other platforms has, according to many, increased time spent in front of a screen and decreased time with patients. And many systems are set up to prevent non-MDs from accessing certain tasks, leaving physicians unable to delegate. I’m not going to pretend that these fears are unfounded. But from my perspective, a tool that helps clinicians identify patients in greatest need of help also helps clinicians focus their time on those high-risk individuals. Ultimately, our goal is to create efficiency in managing large populations by helping physicians to quickly identify who is suffering, rather than spend their time combing through records. We’ve found the key to driving efficiency is to assign a clinical champion to own the program. Empower a nurse, respiratory therapist or medical assistant to get to know the platform inside and out, enroll patients, educate providers and keep an eye on analytics. Q. How do I get my patients engaged enough with digital medicines for the data to be useful? Digital medicines work passively in the background of patients’ live to gather insights, but they still need a certain degree of engagement or syncing to produce useful data. We’ve seen the most success in clinics that implement Propeller as a new standard of care, rather than a one-off tool that can be implemented or ignored depending on how busy the provider is. These clinics have an open discussion with their providers to get everyone on the same page about the advantages of engaging in digital health. We have found that when organizations commit to digital medicines, providers follow suit. In one of our Louisville clinics, this approach resulted in 200 patient enrollments out of 200 total patients in the clinic – a 100 percent success. Q. My patients are used to having a human interaction with me. Won’t this change our relationship? Patients are already used to incorporating digital experiences into almost all their interactions. No one bats an eye when a bank teller pulls up their account to check their most recent transactions for fraud, or when a cashier lets them know they have $10 in bonus rewards to spend in their loyalty account. Increasingly, patients will expect their healthcare visits to involve a digital tool. In fact, digital medicines can vastly improve the patient-provider relationship by enabling a much more direct and honest conversation. For example, imagine that a patient comes into your office, and you ask them how often they’ve been using their inhaler recently. They say, “Not very much,” but you suspect that they’ve been using it a lot, whether they realize that or not. You have to pursue a difficult conversation where the patient may feel accused of lying to you. This interaction frequently leads to distrust on both sides. Now imagine that with a digital medicine, you could avoid that conversation entirely. Instead, you could point to the data and say, “It looks like you’re using albuterol more often on Tuesday afternoons. How can we work on that?” This approach marries objective data with empathetic conversation, leading to more productive time together and a better patient-provider relationship. If you’re interested in meeting with Propeller leaders during ACAAI, please don’t hesitate to reach out to our team at [email protected] We would love to speak with you about how digital medicines can help drive better outcomes, lower costs and happier patients.